"We admitted we were powerless over alcohol (or any other mind altering substance) that our lives had become unmanageable." Time for some brutal honesty here. I have not been completely sober this past year. I have been sober from my drugs of choice for the last year, yes. But, I have not been completely sober. First admittance, I have had a few "run ins" with ambien. I was prescribed ambien to sleep by my doctor, and there have been a few times over this last year where I have abused ambien. I have taken more than prescribed at times, and there have been times when I have been sick where I took it all day and all night for a few days straight. I told my therapist about this and we actually called my pharmacy and cancelled my refills and then we called my doctor and told him that I have abused this substance and to put into my chart that I cannot handle ambien. Next admittance, when I was in treatment, I was prescribed a drug called Suboxone. I was prescribed this because I was dealing with chronic pain in my back and neck when I went into treatment and a low dose of suboxone helps with chronic pain. It is a narcotic that does not produce as much of a "high" as other narcotics like oxycontin. It is also 20 times more powerful than morphine at low doses, so it effectively masks pain. The problem is, when I first started suboxone, I knew that I liked the way that it made me feel. It helped with anxiety, sleep, and of course the pain. Since I got out of treatment, I started taking more than prescribed and abused the medication. I rationalized this all year long, because it was prescribed by my addiction doctor. However, I have been telling my therapist for months that I was going to get off of this, but I haven't taken the steps to begin tapering down from this medication. When I got my wisdom teeth out a few weeks ago, I was taking suboxone and ambien all weekend long to deal with the pain. I went in to my therapist and told her about this. She finally called me out and said that I had a dependence to this drug and I needed to get off of it. I denied this like crazy. I rationalized that I needed it and it wasn't a problem to take more than prescribed. Over the course of the session, I finally admitted that I had a problem with this drug. This triggered so much shame. This made me so upset, because I realized that I haven't been completely honest with myself and I haven't been completely sober like I thought I had. Immediately my first thought was, "well if I haven't been completely sober, then screw it, I am just going to use my drugs of choice." I was really close to relapsing. After a week of processing this, I am finally to the point where I am ready to be brutally honest with myself and others. The truth is, I have no control over my medication management. I wish more than anything that I did, but the truth is, I don't. I have been sober from my drugs of choice for almost a year now. This is something to be proud of and celebrate. Is there room for improvement? Absolutely. I am ready to admit that I cannot take ambien any more. I am also ready to admit that I have a problem with suboxone and it's time to start tapering off of this medication. The first step is the hardest step. But, it's also the most important step. I am powerless over these substances. Fortunately, I believe in a higher power than myself that can help me remove these substances from myself. Brutal honesty is essential if I want to live a life in recovery, which is something that I have been striving for this past year. AND, I have done a dang good job at recovery this past year. I am so grateful for my recovery journey. This is just a bump in the road. This is a growing and learning experience. This has taught me even more about myself and what lies ahead in my recovery journey. I know I can do this. 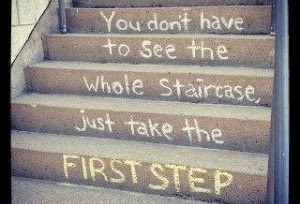 It's all about taking the first step. I just wrote u a long comment thanking you n fot being brave. I lost it trying to send to u! I'm super sad about it n can't remember everything I typed... WTF?